I started thinking about the cause and effect aspects that relate to the idea of Karma. In the end, I decided to think about it in relation to a story where a writer who had some belief in the idea dealt with it. 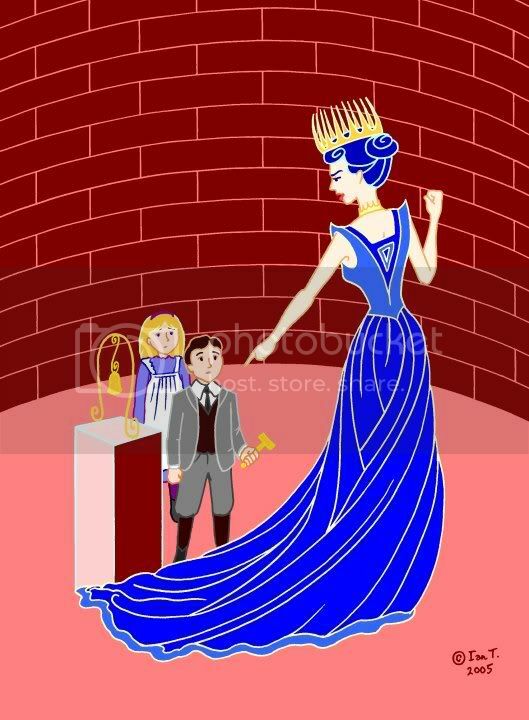 C. S. Lewis's The Magician's Nephew sprang to mind - I recently read it to J and L, and the scene where Digory rings the bell in ruined Charn and awakens Jadis (against Polly's wishes) has a real air of Karma to it, and it certainly has consequences. I wanted to use a flat art Nouveau type style, with coloured outlines and no graduated colour, in the tradition of Louis Rhead or Aubrey Beardsley (even though he worked in black and white), though I think there are elements of Kay Nielsen there too, now I look at it. The drawing was done in three parts, which I then scanned as layers (300dpi 2bit b&w TIFFs), converted to colour, and finally combined when colouring was well-progressed. Yeah Ian! Very nice treatment of one of my favorite stories (love your colors and the scale of Jadis - briliant), and nice treatment of this troublesome topic this week. (troublesome for me for the same reasons you state) I love what you did with it! Are you excited about the Lion the Witch and the Wardrobe movie coming out? Kerry and Bee'nme have covered well. I love the 'plaited hair' Nouveau style dress signifying knots one can weave. Can also see a Grimm Fairy Tale vibe to your illustration. I can't wait for the Lion the Witch and the Wardrobe movie!! I'm sort of keen to see the film of The Lion, The Witch and The Wardrobe but also very apprehensive about it (not as much as I am about the film of Life of Pi though). We all went and saw an excellent stage musical production of The Lion, The Witch and The Wardrobe (for children) last year, that used puppetry for many of the characters. The BBC TV productions of the Narnia books had their moments too, though the casting of Lucy and the way the Beavers were done were a travesty! The best entry in that series is The Silver Chair (with superior Doctor Who, Tom Baker, as Puddleglum)! The books are inconsistent, but beautiful and truly magical at their best. Tolkien gave Lewis some criticism about them as they were written (at what he considered to be an indecent pace of one a year). The Last Battle in particular bothers me with many of its decisions - a sad end to a fine series, despite winning the Carnegie Medal, which should have been awarded much earlier in the series! Also, the character of Digory in The Lion, The Witch and The Wardrobe is utterly different in every respect to the younger version in The Magician's Nephew. Thanks for the feedback! I tried to go purely with my own interpretation of the text, without being influenced by Pauline Baynes' magnificent illustrations, so I had to research my own Edwardian clothes for the children and design the rest in accordance with the book. I adore those books, hence the name "Aravis." I love what you've done here! Aravis, I thought as much, but I didn't want to ask (just in case it was your real name :))! A Horse and His Boy is an odd entry in the series, but an excellent standalone in its own right. ah! I remember this story! I haven't thought about it in years! I'll have to revisit it! This is a great illo, I love the hair and crown particularly! i can't help looking at it over and over again...your illustration is really beautiful and I like how you can make fine strokes(i cannot anymore because of my hand)and the color of the skin ís perfect! i like the colors and the beautiful gown-everything about it.i hope to get the book soon! Fantastic! When I first read that slim volume, so long ago, and got to that part in the book I remember yelling aloud (rather embarrassingly): Don't do it! Don't strike the bell! You silly children... but then, the story wouldn't have been as interesting without the menacing witch Jadis, now would it? Your rendition is perfect for this theme. I'm a big fan of the Narnia series and have read it many times, both as a child & as an adult! Digory looks exactly as I'd imagined him here, but Polly is a bit different. This is very sweet. Isay, I have to admit that I drew these with Uniball markers (which have pigment ink) and used a French curve to make some of the lines. Ali, I can see the silk painting idea, though it would never have occurred to me! Anglique, that's exactly how I see it, and why I think of it as a Karmic moment. Fern Lady, I'm not totally sure about Polly either. It's funny drawing your own visualisations of characters - even trying to match some of what's in your head - and also very odd when you see other peoples' :). Peter Jackson's The Lord of the Rings hit me that way: like and yet unlike - "right" in this bit, totally different in that bit. Text alone allows total freedom to imagine, but I do like a book with pictures too :). "Strike the bell and bide the danger" I think is how it went...the poem has always stuck in my head when making big decisions. Of course, the lesson in this case appears to be not to, but I do understand where Digory's coming from in his decision :).